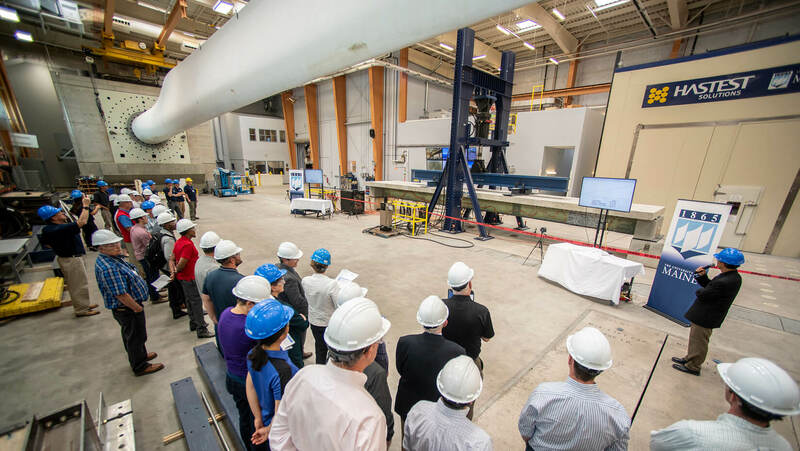 The University of Maine unveiled an innovative, rapidly deployable bridge system Thursday, July 12 at the Advanced Structures and Composites Center. Engineers, Maine Department of Transportation officials, business leaders, investors, researchers, staff and representatives from Advanced Infrastructure Technologies (UMaine’s licensee for the original “Bridge-in-a-Backpack”) attended the event, at which a composite bridge girder was strength-tested using computer-controlled hydraulic equipment that simulates the heaviest highway truck loads. The strength test was conducted for the first time to confirm the design modeling predictions, and demonstrate the bridge system can withstand the truck load specified in the American Association of State Highway and Transportation Officials (AASHTO) Bridge Design Specifications. The patent-pending system, developed at the UMaine Composites Center, utilizes composite material girders and precast concrete deck panels to reduce the time and logistics to build a bridge. The lightweight highway bridge superstructure can be built in 72 hours, a considerable improvement on the time it normally takes to build a bridge. In addition to significantly reducing construction time and logistics, the new bridge girders are designed to last 100 years, and the precast concrete deck is designed to be easily removed and replaced. The bridge system can be used for highway bridges, pedestrian bridges and military applications. The design is targeted for short- to medium-span bridge applications, up to 80-foot unsupported spans. “Today’s bridge test exceeded our expectations. The composite bridge withstood forces equivalent to more than 80 cars stacked on top of each other, and more than five times the HL-93 design load specified by AASHTO,” said Habib Dagher, executive director of the UMaine Advanced Structures and Composites Center. “The composite bridge girder exceeded twice the collapse strength of steel and concrete girders. Today was truly a remarkable engineering achievement made possible by research sponsored by the U.S. Army Corps of Engineers and the dedication and hard work of university researchers. Brit Svoboda, chairman and CEO of AIT Bridges, commented on the successful results. “As the commercialization partner of the Center’s composite arch bridge system, today’s event allowed us to showcase this new technology with potential investors as well as DOT partners and executives. We’re ready to go to market,” said Svoboda. U.S. Sens. Susan Collins and Angus King issued a joint statement about the bridge system test.